Product #60831 | SKU XSW-D XLR BASE SET | 0.0 (no ratings yet) Thanks for your rating! The Sennheiser XSW-D XLR BASE SET is an easy entry point into the world of wireless microphone audio for singers, vocalists, and presenters looking for a stage-ready system that's both cost effective and simple to use. It puts world-renowned Sennheiser wireless sound quality in a miniaturised, plug-and-go, 1-button digital system that anyone can operate. Plug it in, power it up, and you're immediately up and running, streamlining your setup so you can concentrate on delivering your performance with confidence. The XSW-D XLR BASE SET comes with a plug-on transmitter ready to be used with a handheld dynamic microphone of your choice. The XLR-equipped, plug-in receiver connects to a wide variety of professional audio gear, including mixing boards and portable PA systems, allowing you to capture crisp-sounding vocals on stage, or in rehearsals, houses of worship, and event spaces. The exceptionally lightweight and compact plug-on transmitter lets you connect any dynamic microphone equipped with an XLR connector. The transmitter is designed to only transmit signal from a mic (not from a mixer or recorder) and it does not provide phantom power. The functionality of this XSW-D XLR BASE SET can easily be expanded by adding XSW-D Series transmitters, as your needs evolve. 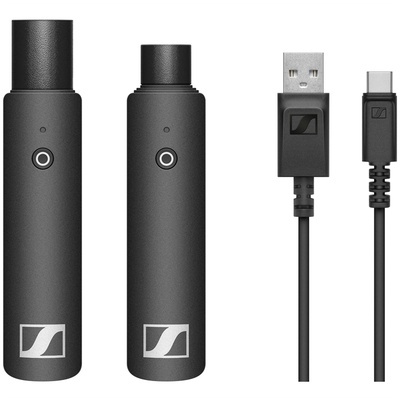 With this set, adding the XSW-D 3.5mm bodypack transmitter allows you to connect either a Sennheiser-compatible lavalier or headset mic of your choice for hands-free presentations. Simply let the system pick a channel for you, and you're ready to go—whether you're working at home or anywhere in the world.